Everyone please pray for me today! Starting my new job! As you can see, I am procrastinating because I DO NOT want to leave! Aaron will be staying with my grandma today, then will be starting back at his sitter on Monday. I am going to miss him terribly. He is sitting on my lap right now. I just want to sit here all day! I am so very nervous, but excited that we will be able to get our lives back together. Well, I hope you have a great day, thank you so much for stopping by! You all make my day! Here is a card that I made this morning for someone very special-my gma! Gonna sneak it in her mailbox later (since she lives next door) because I love her so. I'm kinda loving this card! :) The background is a paint sample! 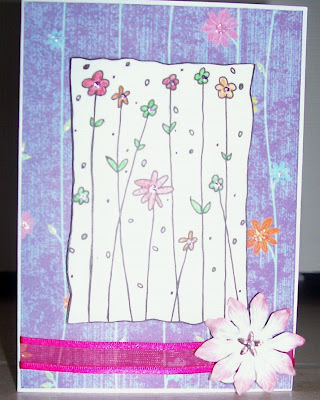 (Thanks to my Happy Scrappers buddies who shared this neat paint card idea with me!) I went to Lowe's yesterday for some WallPops and took a couple of these with me! These were so cool because they had 3 coordinating colors, plus the cute little cutouts at the bottom! And-they were free!! I couldn't tell you where the flower and ladybug stamps are from. Just found them in my stash. I colored them with SU! colored pencils and tried out my gamsol for the first time! I could use a little more practice, but I love this stuff! The flowers are Primas of course, plus a cute gingham brad in the middle! The wording in the sentiment says "This is the day that the Lord hath made, let us rejoice and be glad in it. -Psalms 118:24." This is a SU! stamp. The paper it is on is very shimmery, so I couldn't get a decent pic! Also went around the sentiment with pale pink shimmery chalk from my Pebbles Inc. set. Like I said, I am really loving this card! I've been thinking about adding a ribbon, but I might just leave it the way it is. What do you think? Well, that's all for now. Today is my last day home with Aaron before I start my new job tomorrow. :( Going to miss him like crazy! So I am going to spend the rest of the day with him! I hope you have a great day, and thanks for stopping by! Ok, first off, for all my hometown friends or anyone within driving distance to Winchester, VA-you have to go to the Studio Art Shop!! I was at Michael's the other day looking for gamsol which they didn't have of course, when this cute little lady mentioned this art store. I'd never heard of it, so this morning I gave them a call and asked if they had gamsol-which they did! I told her I wanted it for rubber stamping, and she said that they had a ton of rubber stamps and scrapbook supplies. I didn't really expect much, but I should have because this store is awesome! Not only do they have stamps, they have really, really cute stamps! They have the newest stamps by the best companies. And their scrapbook supplies were the same way! Their paper was great! I am just so very thrilled that I found this gem! I will be going there instead of Michael's from now on! Plus they're prices were great! Unfortunately I was on a bit of a budget today, plus I had to stop and get a prescription filled, but I did end up with some great things! I got my gamsol, a little pencil thing to apply it with, a new Stickles color that I didn't have, brads with bling, some great paper (won't that blue and green be perfect for Aaron's scrapbook?! ), 2 packs of DCWV grosgrain ribbon, and a flower Coluzzle template! The ribbon and the Coluzzle flower were 50% off! I also stopped at Michaels before I went there and got 2 new Studio G stamp set-one is "You are my Sunshine" and the other is a cute little pregnant lady with stamps for a baby shower! I also got 4 wooden $1 stamps, "From the heart", flowers, a baby bottle, and a "Thanks" with hearts hanging down! Had a really great shopping day! Well, that's all for now, no new crafty things to show you, but after I clean tomorrow I'm hoping to scrap some more since I did 4 new pages over the weekend! Now I'm on a roll!! Thanks so much for stopping by! Here is what I did for the VSBN American Idol challenge, where you had to do a layout about performing. 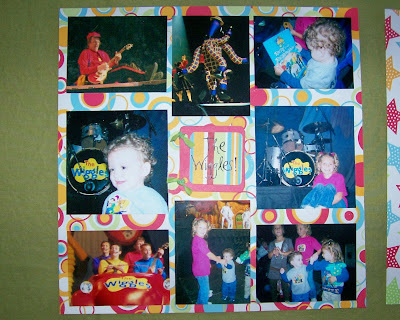 That was great for me because I still had a pile of pics from when I took Aaron and Lexy to see The Wiggles in October! I made it until about 8:30 last night, so I ended up making this this morning! I saw a layout a few weeks ago with this cute square technique, so I was excited to finally try it out! 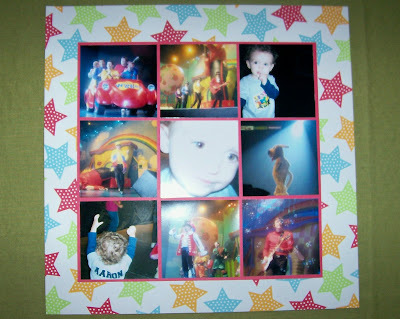 Then after I finished it, there was a challenge called Hollywood Squares where you had to do a layout just like this! Oops! Oh well! Well, that's all for now, hoping to do some more later if I can get the energy! Thanks for stopping by! Here is my first time doing a challenge at VSBN on Splitcoast! It was so much fun! The first challenge was "Re-Run" where you had to do a past challenge that you missed the first time around. The challenge I chose was "What color crayon are you?" and I am the color red! So I had to use red in my layout, which was great because I still have so much from Christmas! 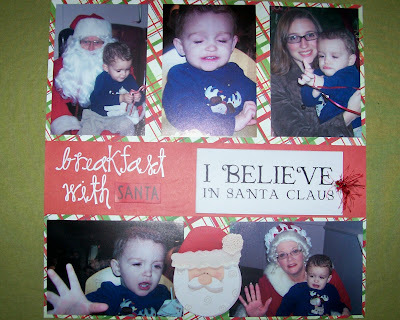 These pictures were from last year's breakfast with Santa! As you can see, Aaron didn't like Mrs. Claus, didn't care about Santa Claus, and did NOT want his picture taken! Not the best pics to work with but I still wanted to scrap them! The patterned paper and the red strip of paper is from Bo Bunny. The "Breakfast with" are white AMM rub-ons. The "Santa" and the actual santa sticker are from Doodlebug, and I pop-dotted both of them. The "I Believe in Santa Claus" is a DCWV vellum quote. It is on white cardstock which I made a mini-book out of for journaling! I put a green eyelet in the side and tied it together with a fiber that looks like red tinsel! Well, that is all for now. Was hoping to do some more challenges tonight but Aaron is being very clingy and I am getting tired! Thanks for stopping by! I really like how this page turned out, even if the pic doesn't do it justice! I haven't done a layout in a few weeks, and I'm so happy that I've had a few hours to scrap! The paper I used is Bo Bunny Classic Christmas, and the ribbon, "Christmas" sticker, and 08 (now 07) stickers are from the same line! The circle is the '07 on a Daisy D's rub on circle that says "the magic of christmas" around it. I put the rub-on on vellum, which I mounted on a sheet of cardstock. I cut the circles with my Coluzzle. 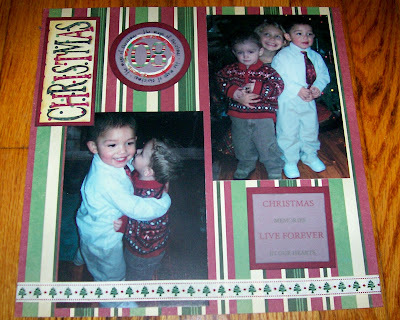 The vellum quote is from a DCWV Christmas Quote Stack and it says "Christmas Memories Live Forever in our Hearts". I also pop dotted everything that is matted cardstock! I love pop dots!! Well, I think that will be all for today! I am hoping to take pics of my scrap room this weekend, but since I've been scrappin' today I need to clean my mess up first! :) Also, don't forget to stop by the VSBN tomorrow (see my earlier post) and get some work done! I'm so excited that my very talented friend Becky is going to be a part of this! Can't wait! Have a wonderful night! Hi everyone! Here is a card I made for Easter, will probably give it to my niece so it is so shiny and sparkly! Woke up in a card-making mood! 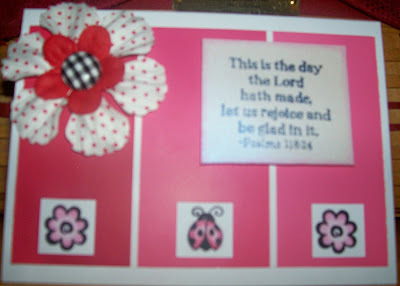 I Cuttlebug embossed the front of the card with the Spots and Dots folder. Then I went over each circle with Pebbles Inc. Irridescent chalks in orange, yellow, pink, blue, and green. The bunny is from the Cricut Stretch Your Imagination cart. I added google eyes, some pink bling for his nose, a rub on smile, a pink chalked pom pom, and I chalked his little ears! The patterned paper is Doodlebug, and I cut that and the yellow oval with the George cart. The sentiment is a Studio G $1 stamp that I got over the weekend. I tied a really cute purple stitched ribbon around the front, and added 3 flower rhinestones. 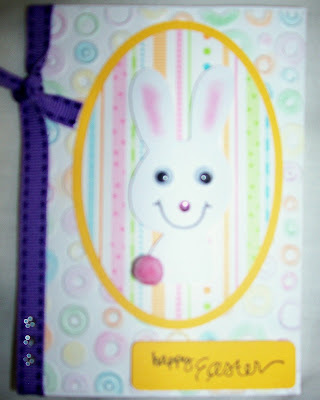 I also pop dotted the bunny and the sentiment.I wish you could see the detail in this card! Especially the sparkly chalk! The bunny really stands out on the card, but in the pic it doesn't look the best! 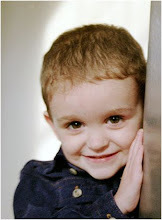 Here is a pic of my sweet little innocent boy from yesterday. He got a few new movies yesterday so we were both in his room reorganizing his movies to make room, and he walked out. I followed him less than 30 seconds later. 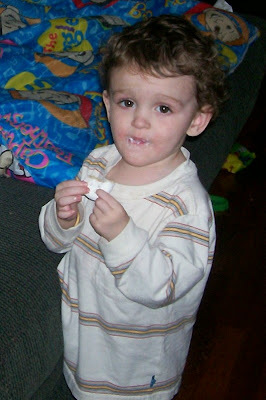 In that time he got the donuts OFF OF THE COUNTER, opened them, and had a white powdered mess everywhere! Luckily he had his Wiggles blanket on the couch from that morning, which is easily washable, so I didn't have too much of a mess to clean up on the couch! It was just so cute! Well, that is all for now. I am hoping to take some pictures of my scrap room this weekend to show you! I've been working hard trying to get rid of some things and get everything organized! Hope you're having a great day, and stay warm! UPDATE: I got the job! Back to work in the pharmacy-should be starting next week!! Hopefully this will be the start of a change of luck for us! OOPS! I can't believe I forgot to show you guys the AWESOME blog candy I won last month! See, I told you I was slacking. 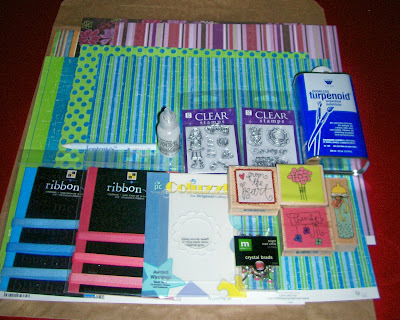 The candy was on Zee's blog, and the winner could pick out whatever Lizzie Anne stamp set they wanted! I chose this one-Petite Phrases. Isn't it adorable? I haven't been able to make any cards with it yet, because the only card I've made in more than a month is the one I showed you guys a few days ago! I did stamp a few images and color them just for fun though! Isn't it a great set?! Well, thats all for now. Aaron is napping and I am resting while watching some I Love Lucy episodes! Hope you're having a great day! Oops, I forgot another birthday! Had to do this card in just a few minutes last night. Don't mind how it turned out considering it was so last minute. This is for my aunt, who's favorite color is purple and she LOVES flowers. I just used a scrap from the DCWV Pocket Full of Posies paper, a sheer ribbon that was 10 cents at the outlet, a prima, some bling, some Stickles, an a really old Hero Arts stamp that I've had and never used. I colored it in with my SU Pencils. (Fixed the ribbon too so its not crooked!) Also used some Studio G $1 stamps in the inside for the Happy Birthday! Sorry again for the bad pic! I hope you all have a wonderful day! We are getting ready to go to church now, then my hubby is taking me to dinner and a movie for Valentine's Day! (I was sick on the actual day. And if that wasn't good enough, he's taking me on a shopping trip to Michael's and ACMoore! YAY! So maybe I'll have some new goodies to show off tomorrow! Thanks for stopping by! Here are a few little altered items I made for my niece. I was going to give them to her for Valentines Day, but didn't get them ready in time. I am also going to cover a journal and a clipboard for her too! But that's another day! The mailbox is from Target of course, and the other container is from a Krista Light container I think. (This one is for her pens/pencils!) I used DCWV Pocket Full of Posies paper for both of these. (BTW, has anyone seen the new DCWN Blossoms and Butterflies line?? SO CUTE-gotta have it!) They already had glitter on them, but I did add quite a bit of Stickles! The ribbon I used is great, isn't it? It is some sort of specialty ribbon that was sold at Target, but I got it at our ribbon outlet at a Christmas sale and got it for a penny!! ONE CENT! (I also got it in orange and purple!) On the side of the mail box I put her name in chipboard and added some bling! The flowers were Primas and some flowers from a $1 bag at Michaels! The bling is from Walmart! The whole pack was $2! The only thing I need to do is tie ribbon around the flag, but I have SO much ribbon I just couldn't bear to look through it! Maybe later! Sorry for the bad pics, it is just so dark in here today. I honestly took 20-30 pictures of both of these and this was the only one that worked. Do you think a girly little 6 year old will like these for her new "adult" desk?! I haven't done any crafting at all for a few weeks. I am really slacking! I am just too tired. Being pregnant with a toddler is hard enough, but when you never feel well, its pretty tough. I need to go make my husband a birthday card because I just realized I hadn't done it yet! Today is his birthday and I'm throwing a big family birthday dinner after church later on. Its my first time hosting a party of my own in my own home! I'm really excited but at the same time I'll be glad when today is over because I have been doing so much to get ready for today! Its Jamie's 30th birthday though, so I wanted it to be special. But everything is just so crazy I forgot to make him a card! 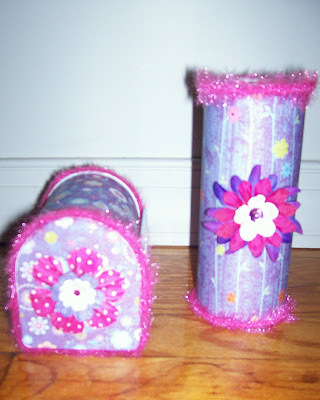 I also plan on altering another Target mailbox for my niece for Valentine's Day! Hopefully I can get everything done. I hope you are all well. Haven't done a blog hop in a few days, maybe I can do it tomorrow. Hopefully I'll have a few things to show you in the next few days! Thanks for stopping by!